If you’re planning on surfing Southern California, then Trestles should be one of the main spots on your list of places to go. Surfing Lower Trestles isn’t something super technical that requires local knowledge like many of the famous reef breaks around the world, but there are still some simple things that you should know if you’re heading there for the first time. For one thing, just getting down to Lower Trestles can be quite a journey if you’ve never been there. But once you do make it, you’ll find one of the few waves in California that you can depend on to be surfable and really fun almost any day of the year. Even during small swells when the waves are not working anywhere else, the peak at Lowers can still be working really well. Of course a wave this good always comes with crowds and locals, so here are some things that should help you stay under the radar on your first time out there. 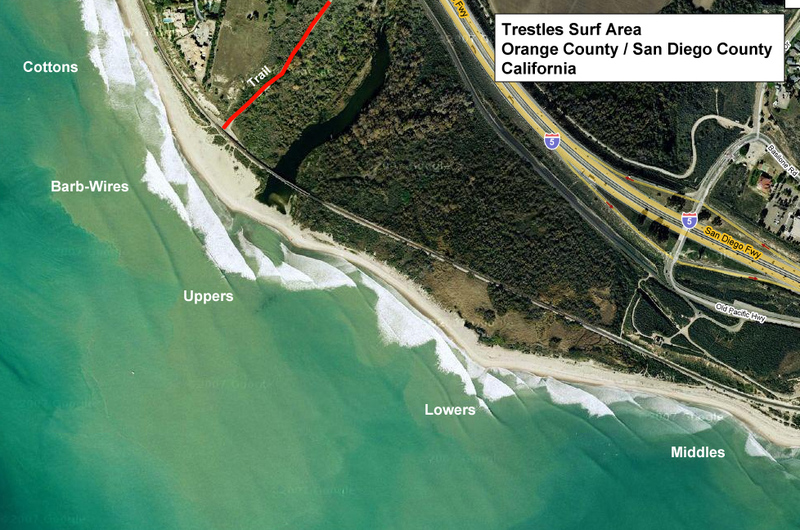 There are a few different options for getting down to Lower Trestles. The first and most common way is to park in the lot off of the Cristianitos exit, and then follow the crowd of surfers walking across the freeway and down the road to the beach. It lets you out in between Uppers and Cotton’s, and then you just continue south to Lowers. Your second option is to get dropped off at the Basilone Exit (the next exit south from Cristianitos), and you’ll have a much shorter walk to Lower Trestles down the dirt trail, which is easy to spot. You cannot however park off of the Basilone exit. The last option is to park in the San Onofre State Beach area and walk north to Lowers. The downside of this option is that it costs $10 to enter the State Beach area. Once you get to Lowers the rest is pretty simple to figure out. Lower Trestles is a peak that goes left and right almost perfectly every day of the year. So don’t paddle straight out in front of the peak or you’ll take every wave on the head. Paddle out just north or south of the group and you should get out easy. Paddling out on the north side is sometimes a bit easier as the rights can be a bit more consistent and last a little longer. One other word of advice is to not paddle right to the outside of the group and go for the best waves of each set right away. The guys that have been waiting expect you to wait your turn. I usually sit in the middle of the group for a few sets and go for the middle-sized waves before making my way to the outside of the group for the best waves. As long as you show some respect and surf smart the locals won’t give you any problems out at Lowers, no matter what you may have heard about the place. That being said, Lower Trestles is still a high performance wave and most the guys out there rip. So if you are not too sure of your surfing abilities I would stick to the other spots that Trestles has to offer and you’ll end up catching way more waves and having a better time. Lowers is definitely a competitive wave and you can spend a whole session fighting for waves only to end up with just a few good ones. Although the other spots at Trestles are not as perfectly shaped as Lowers, they are actually extremely good waves compared to most of Southern California, so check them all out while you’re there.